FREE Antelope Worksheet – Download this fun easy science for kids activity sheet to print. This free science kids activity sheet is suitable for kids in Grades 1-5, as well as Pre-K and Kindergarten kids. Primary school kids can enjoy learning fun facts about Antelopes while using this worksheet as a reading comprehension tool. Kindergarten & Pre-K kids can enjoy the Antelope worksheet as a listening comprehension tool. With this Antelope easy science activity sheet, kids will have fun learning facts about Antelopes. Teachers and Educators can use the Antelope facts for kids worksheet for science classes, after school enrichment programs and as homeschooling activities. Our Fun Science for Kids Website offers many free science kids activity sheets to print. Antelopes are part of the cattle family. Antelopes are related to cows, sheep and goats. They are many different types of Antelopes and they differ base on their antlers (antlers are Antelope horns). Pronghorn Antelopes loses their antlers every year. Find out more Antelope information for kids and Antelope characteristics by downloading the fun free Antelope worksheet! 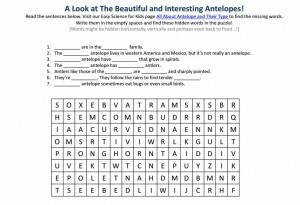 [sociallocker]Download the FREE easy science activity sheet about Antelopes. Download FREE Antelope Worksheet for Kids! Like the Antelopes Worksheet? For lengthy info click here. Declan, Tobin. " FREE Antelope Worksheet - Easy Science Kids Activity Sheet to Print - ." Easy Science for Kids, Apr 2019. Web. 21 Apr 2019. < https://easyscienceforkids.com/free-antelope-worksheet-easy-science-kids-activity-sheet-to-print/ >.